Quality ingredients don’t need much messing with – like in this quick and easy Deli Salad. I love arranging salads in this style, with ingredients side by side, because it is so visually appealing. As they say, we eat with our eyes first! You can mix this up with ingredients that appeal to you or serve it over mixed greens as a traditional salad. To store and transport for lunch, wrap each ingredient individually in plastic bags or containers and arrange when you’re ready to eat. This is a great quick post work-out meal when you want to feel healthy and light. Steam or boil 5 asparagus spears for about 5 minutes. Slice 1 medium tomato and dice ¼ avocado. 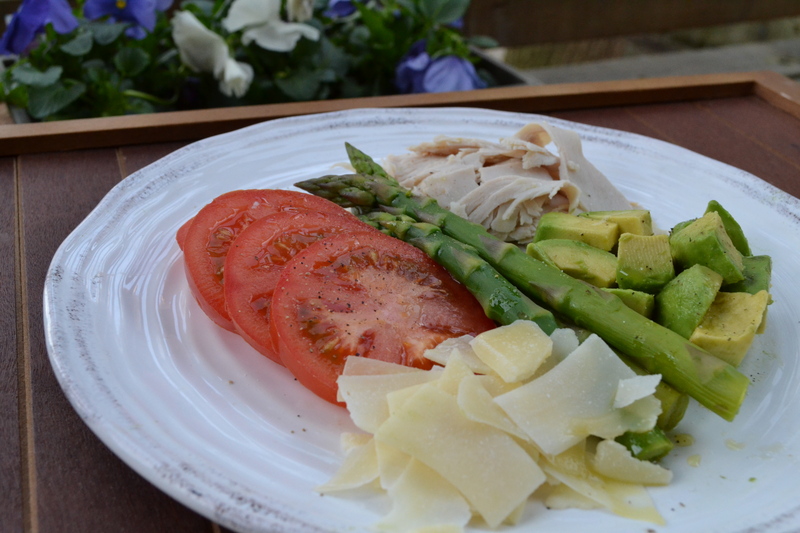 Arrange asparagus, tomato, and avocado on a plate with 3 slices deli turkey and 1 ounce shaved parmesan. Drizzle with ½ teaspoon olive oil and season with salt and pepper to taste. Yield: 1 serving. Per Serving: $4.56, 300 calories, 16g fat, 23g carbs, 22g protein. This entry was posted in Salad and tagged Asparagus, avocado, salad, Turkey by cooklikekayla. Bookmark the permalink.